The Works offers several opportunities through the Serving Communities Internship Program (SCiP), a Volunteer Alberta initiative that addresses the needs of non-profit organizations and provides post-secondary students with meaningful, skill-based work related to their field of study. Each SCiP internship is part-time, short term, and intended to work with existing commitments like school or work. After successfully completing the internship, students are awarded a $1000 bursary. The Works is hiring for several SCiP positions. To apply, students must be registered with SCiP. In Search of Eden by Emmanuel Osahor at The Works Art & Design Festival, 2018. Photo by Francheska Agoncillo. Work closely with 2019 presenting artists to deliver a large-scale public artwork. The Works Art & Design Festival, 2018. Photo by Nicholas Verdi. Document key moments during the festival. 塑胶狮 (Su Jiao Shi) by Yong Fei Guan at The Works Art & Design Festival, 2018. Photo by Laura Cercel. Use administrative skills to ensure The Works volunteers' experience is positive and rewarding. The Works Art & Design Festival, 2018. Photo by Francheska Agoncillo. Assist the production crew in erecting the infrastructure necessary to withstand all weather conditions. The Works Art & Design Festival, 2018. Photo by Fren Mah. Keep The Works Street Stage running smoothly. The Works Art & Design Festival, 2018. Photo by Selen Erkut. 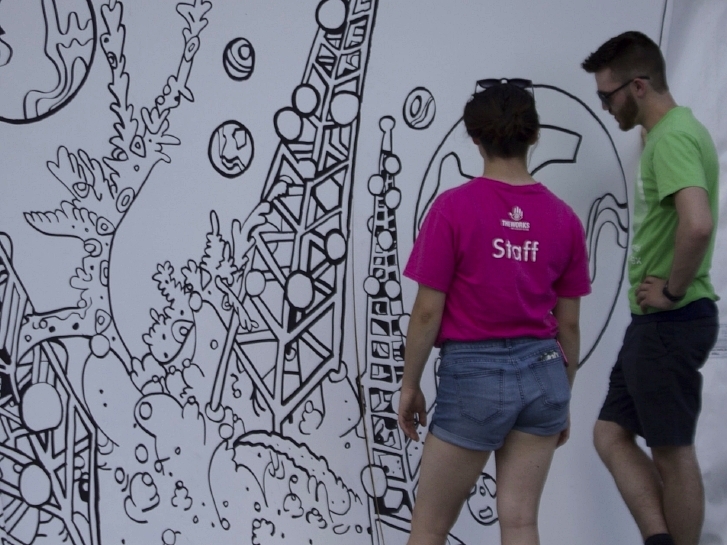 Work with experienced graphic designers to implement the festival campaign.